Earlier today, as American Airlines' London-bound Flight 90 pushed back from the gate at Chicago O'Hare International Airport, passengers in the terminal beheld an unusual sight: The pilot popped open the cockpit window to hold out a flag bearing the carrier's original eagle logo, which fluttered all the way out to the runway. While new to present-day passengers, the flying of the company flag was actually a reprisal of a venerable tradition. 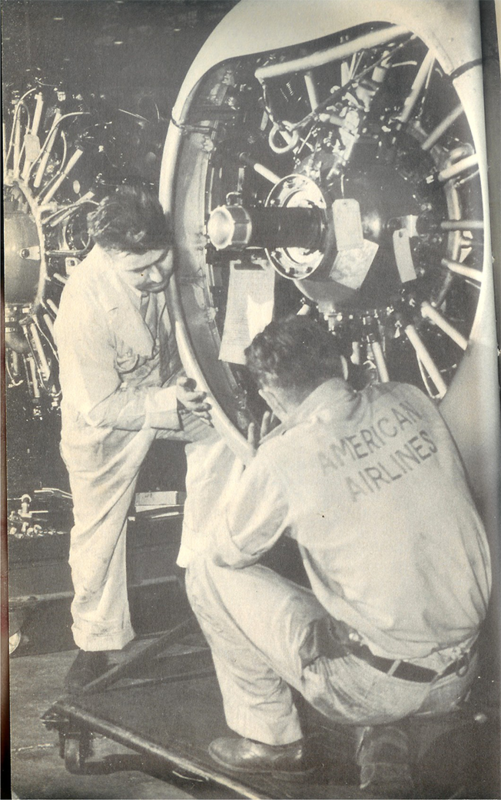 A venerable tradition for a venerable carrier: American Airlines turns 90 years old today. With 19 billion in revenue passenger miles and a fleet of 627 planes, it's easy to overlook the fact that American Airlines isn't just the world's largest carrier, but also a survivor from the pioneering days of American aviation—a time when airplanes had propellers and the cabins weren't yet pressurized. Today's passengers might grouse about the baggage fees and diminutive coach seats, but the fact remains that American was a pioneering airline. It was the first to introduce nonstop coast-to-coast service in 1953. It was the first to hire an African-American pilot (his name was Dave Harris, and his picture is below.) American also introduced loyalty programs to the flying public when AAdvantage made its debut in 1981. Most of today's fliers probably can't even remember back that far. So here's a peek at American Airlines over its nine decades of takeoffs and landings. On April 15, 1946, the chief pilot of air mail carrier Robertson Aircraft lifted off from Chicago in this DH-4 biplane and flew to St. Louis. In 1930, Robertson Air would be one of the small aviation companies incorporated into American Airlines. And the pilot's name? Charles Lindbergh. All American Aviation was founded in Pittsburgh, Pa., in 1939. This carrier would later be known as US Airways, which was destined to merge with American. American Airlines opened its Airlines Stewardess College in Dallas/Fort Worth in 1957. It was the world's first facility dedicated solely to the training of, er, flight attendants—which is what we call them today. In 1964, Dave Harris became the first African-American pilot to fly for American—and any carrier in the United States, for that matter. US Airways Group tied the knot with American on December 9, 2013, creating the largest carrier in the world.